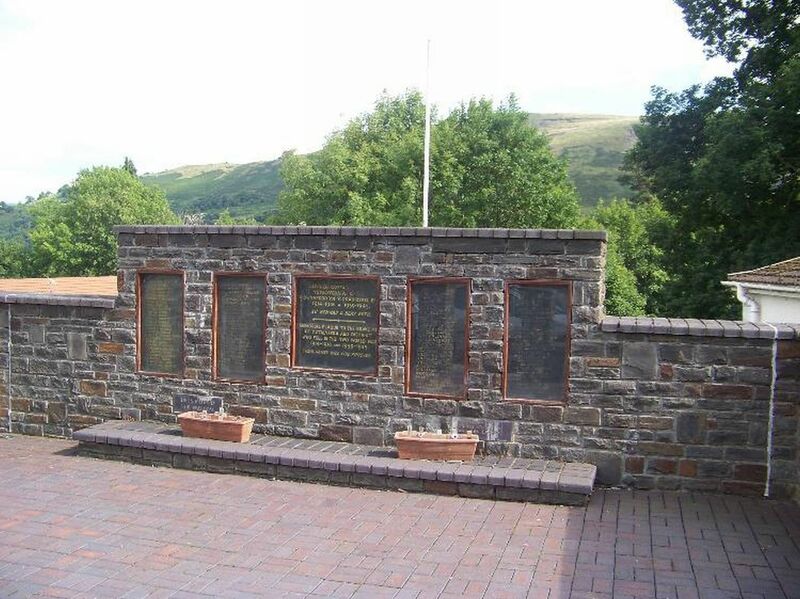 This is the memorial page for Thomas Robert Martin, native of Ystalyfera, killed during the First World War. He appears to have used his middle name as his given name, not uncommon in the period, and to have shortened Robert to Bertie as a by-name. 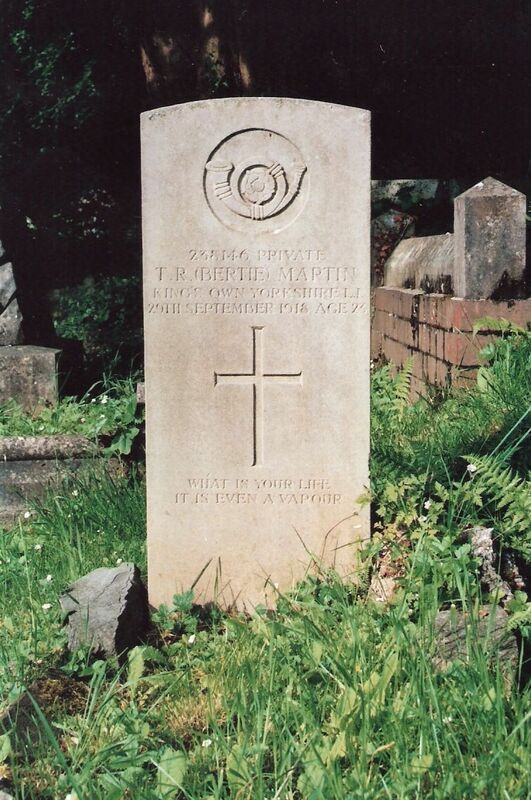 The information on Bertie Martin comes principally from the Commonwealth War Graves Commission, from the Labour Voice newspaper, and the Parish Burial Register (courtesy of the Swansea Archives). Unit and Regiment King's Own Yorkshire Light Infantry; 5th Bn. Additional Information Born at Ystalyfera. Resided at 3 Cinder Road Ystalyfera. Husband of Alice Martin of Green House Marloes Milford Haven. Grave inscription: What is your life/It is even a vapour. Family Details Son of John Isaac Martin (b 1868) and Jane Martin (b 1872) of Hereford House, Glanrhyd. Drummer Thomas R Martin of the Brecknocks, formerly stationed at Dale (Pembrokeshire) was home on short leave last week prior to his departure to join the 5th King’s Liverpool Regiment. He will be greatly missed by his numerous friends at Dale as he assisted at most of the local concerts. Private T R Martin of the King’s, son of Mr and Mrs J T Martin Wind Road, is home on furlough. He has been out in France since January. He joined the Brecknocks soon after the outbreak of the war being afterwards transferred to the Kings. Private Thomas Robert Martin of the K.O.L.I., son of Mr. and Mrs. J. I. Martin, Hereford House Glanrhyd, who has been home from France on furlough, was married on Sunday morning at St. David's Church, Ystalyfera, by special licence to Miss Alice Llewelyn, daughter of Mr. and Mrs. William Llewelyn, Eastfield, Marloes, Pembrokeshire. The Rev. J. Secundus Jones B.A., officiated. Mr. Trevor John Hopkin acted as best man, whilst the bride was given away by Mr. Jack Martin. The bride who was attired in a navy blue coat frock, was attended by Miss Lily Martin, who was dressed in navy blue, and Miss Nora Martin, who was dressed in white silk and the bride and bridesmaids wore necklaces, the gift of the bridegroom. After the ceremony, a reception was held at the bridegroom’s home. Private Martin had been in France since January last and returned on Wednesday evening. He has the best wishes of his friends in the Valley. Mr. Jack Martin, son of Mr. J. I. Martin, engine driver and of Mrs. Martin, Hereford House Glanrhyd, has been passed as an observer for the Royal Air Force. Before joining up he was Assistant Scout Master to the Swansea Valley troop of scouts at Penrhos and was formerly attached to the 1st Swansea Valley troop. He was also a member of the Ystalyfera platoon of the 3rd Glamorgan Volunteer Regiment. Cadet Martin was presented with a Bible at Libanus Glanrhyd Sunday School, prior to his departure. His brother Lance Corporal T. R. Martin, who was also a member of the 1st Swansea Valley Troop of Boy Scouts, has been in France since January 1917, and joined up at the outbreak of the war. Mrs T R Martin (widow); Mr John Isaac Martin (father); Master L Martin (brother); Miss Lilly Martin (sister); another brother, Cadet Jack Martin, of the R.A.F., was unable to be present owing to illness. Other mourners were: Mrs. Hopkin, Mr and Mr. G. Sexton, Mr and Mrs. David Jones, Mr and Mrs. Goodwin Davies, Mrs. Joe Rees, Mr Trevor Hopkin. Mr T Llewelyn Davies, Mr and Mrs Giraldus Jones, Private J Augustus, Mr D T Augustus, Mr T R Martin, and Mr J Smith. Floral tributes were from Wife and Child, Mama and Dada, Lilly and Leonard, 1st S.V. Troop Boy Scouts, and others. A memorial service was held at St David’s Church on Sunday evening to the memory of Lance Corporal T R Martin Glanrhyd, whose death in hospital was reported in a recent issue. Hymns appropriate to the occasion were sung and a Psalm from the burial service was also given. The Rev J Secundus Jones preached a sermon that created a deep impression in the minds of the hearers. Mr D Rhys Jones (organist) played the “Dead March”; the congregation standing. The boys of the 1st Swansea Valley Troop of Boy Scouts under Scout Master Brown and the 8th Swansea Valley Troop, under assistant Scout Master Reggie Thomas attended in parade order. We regret to report the death of a highly respected resident of Glanrhyd, in the person of Mr. John Isaac Martin 4 Snow Terrace. Deceased, who was 62 years of age, had been engaged on the old Midland Railway and latterly on the L. M. and S. Rly. for over 40 years, for many years as engine driver. He was last week removed to the Talgarth Mental Hospital, where he died on Tuesday night. He had been ill since last November. Deceased leaves a widow and five grown up children. The funeral takes place on Sunday at 3 o’clock for Holy Trinity Churchyard Ystalyfera. The funeral of the late Mr. John Isaac Martin, 4 Snow Terrace Glanrhyd, engine driver on the L. M. S. Railway, whose death was reported in our last issue, took place on Sunday last. The burial was at Holy Trinity Churchyard Ystalyfera. Messrs. Jack and Leonard Martin sons; Mr. Roy Hutchins son in law; Messrs. T. R. Martin, J. R. Augustus, George Williams, J. Augustus, Maldwyn Jones, Trevor Hopkin, Goodwin Jones, Tom H. Davies nephews; Mr. D. T. Jones brother in law. ……………….